Sabal Lake Homes: Location, Location, Location! Come in and call home this beautifully move in ready, remodeled home in Sabal Lake with low HOA fees, convenient to restaurants, shopping and beaches! 2Bed+Den/2 Baths featuring volume ceilings throughout and ample windows that let the sunlight in and views of the extended screened lanai and private serene pool. The inviting master bathroom offers dual sinks, an enclosed toilet. Beautifully designed and spacious open floor plan, upgraded Kitchen with new stainless-steel appliances, separate laundry room includes storage cabinets and new washer/drier is located off the two-car garage. Tile/wood floors throughout the house, all bathrooms are thoughtfully remodeled. All brand new fixtures, fans and lamps. Freshly painted with neutral colors inside and out. House is vacant and priced to sell quickly, call for a private showing today! Sabal Lake Homes: As of today the lowest price per sq ft in Sabal Lake! Welcome to this beautiful open concept home with high ceilings, enclosed 16x20 Florida Room overlooking the peaceful preserve, a great place to start the day with your coffee or unwind after a long day. The den off the foyer is already outfitted with a built-in Murphy bed and desk – perfect for a home office and those out of town guests. The Florida room is “wet bar ready” with hookups for your sink and frig. The kitchen is outfitted with stainless steel appliances and granite counter tops. Water softener installed, new roof 2009 and a new AC 2014 just bring your personal touches to make this your home! There is a combination of hurricane shutters and impact glass. Located a short walk to the newly renovated clubhouse with 2 tennis courts and beautiful community pool/spa. The community of Sabal Lake a peaceful neighborhood with no through traffic, low HOA fees, is pet friendly and is just minutes from downtown Naples, Marco Island and the beaches. Bring your offer today! Sabal Lake Homes: Great single story 2/2 home in Sabal Lakes close to everything. This is your opportunity to own in a non gated community that has wonderful amenities and very well maintained. Make your appointment today as you don't want to lose out on this one! Sabal Lake Homes: Light, Bright and close to it all! The architectual design and vaulted ceilings give this 3 bedroom home a great feeling of openness. At the end of quiet cul-de-sac, Large eat-in Kitchen, ceramic tile floors, laminate floor in spacious great room, pocket sliding glass doors to large lanai overlooking preserve. Relaxed living with low HOA fees that include grass cutting and landscaping. Clubhouse with a heated pool and tennis courts. Just minutes to area beaches and attractions and close to shops, schools and dining, it doesn't get any better than this! Sabal Lake Homes: MOTIVATED SELLERS. WILL ENTERTAIN OFFERS! Beautifully updated 3+Den, 2 Full bathrooms, 2 car garage now available in Sable Lake! Brand NEW Roof with 5 year TRANSFERABLE warranty. Volume ceilings and surround sound wired in great room. Extremely private and quiet area, close to sparkling community pool and tennis courts. Pocket sliders open to the refreshing lanai with a new private, patio area. Master bath has large separate soaking tub, mounted flat screen tv, separate tiled shower with seat, dual sinks and a walk in closet. The 2 car garage has ample built in storage cabinets and ceiling rack! 3M hurricane film on windows and accordion shutter on sliders. Den or 4th Bedroom with large walk in closet upstairs has 2 decorative windows, with awesome storage under the stair case. HOA fee includes lawn care, common areas, community pool, tennis courts. This property will not disappoint! Sabal Lake Homes: With all that the Southwest Florida lifestyle has to offer in this location, have access to all the action in this move-in ready home. Offering 3 spacious bedrooms with lots of natural light, 2 full baths. Built-in custom office cabinetry. This home has been completely remodeled with designer finishes! The well-appointed kitchen includes, stainless steel appliances, granite counter tops, a large under mount sink, refurbished like new cabinets with all new fixtures and modern subway tile backsplash. This gorgeous community brings affordability as well as numerous amenities. From the elegant landscaped entry and the wrap-around walk-ways that lead to a beautiful lake. This western exposure home boasts many features, starting with a paved private side entry, a beautiful open/split floor plan that spills your view from the living room into the over-sized enclosed lanai and custom landscaped area. This home was ideally placed on this lot, offers lots of natural light coming through the breakfast nook and living room pocket sliding doors. This home was made inspector friendly by one of Naples' most respectable contractors, it's move-in ready! HOA is only $139.66 monthly. Sabal Lake Homes: SAY "YES" to YOUR NEW DREAM HOME in PARADISE! She's a Beauty with Two large bedrooms and a private Den. The Owners' Suite has it all with separate garden tub & shower, dual sinks, private vanity room, Walk-in closet and sliders to expanded screen lanai & private hot tub. All new Carpet, clean tile and grout, & neutral Paint throughout. Kitchen is meticulously maintained with dining nook & breakfast bar. Separate laundry room includes counter, cabinets & utility sink is located off the two-car garage. You'll love the open concept with high volume ceilings in the living area with views of the serene Lake. Great for entertaining and creating memories with friends and family. 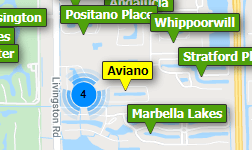 Conveniently located to all major shopping, Olde Naples, Botanical Gardens, Restaurants & more. And LOW HOAs! The lanai is plumbed for an outside kitchen. Enjoy pool, tennis, pickleball & Clubhouse. CALL TODAY! Sabal Lake Homes: H.14233 This well kept 2BR/2BA offers an extended lanai, facing a preserve for privacy and tranquility. Very low HOA fee of $146.00 per month incl. lawn maintenance! The home has security cameras surrounding the outside and you can view them on your mobile phone for anywhere and also your TV at home. A special dyer blower booster was installed to prevent lint blockage. There is an attic fan installed and there is plenty of room for storage in the attic. The garage is plumbed for a utility sink. Sabal Lake Homes: Naples Living at its finest in the highly desirable Sable Lakes Community !! Low HOA Fee !! This is a Perfect Family Home in a beautiful Naples Neighborhood with a Community Pool & Hot Tub, Clubhouse, Tennis Court, Pickle Ball and Gorgeous Lakes ! This Home is only 15 minutes away from the Naples beach and Downtown Naples where you will Enjoy all the fun activities !! Schedule your private Tour Today. Need professional assistance selling your property at Sabal Lake Naples? Find out how an Area Specialist can help to generate more property exposure in order to get the most money for your investment in the least amount of time.